Home Lifestyle New ALWAYS menu at Crosstown Arts! New ALWAYS menu at Crosstown Arts! I work at Crosstown Arts, a contemporary arts center located inside a massive former Sears headquarters that’s been revitalized as Crosstown Concourse into a mixed-use space with arts, education, healthcare, restaurants, retail, and residential apartments. At Crosstown Arts, we host art exhibitions, musical performances, a full-scale artist residency program, youth art workshops, and more. We also have a cocktail bar and a plant-based cafe. The cafe is based on the concept of TODAY and ALWAYS. We have a TODAY menu of daily specials that change out often, and we have an ALWAYS menu of standards that are always available (at least for several months). But that ALWAYS menu will change with the seasons, and we just released a new version of that menu. I haven’t made it through the full menu yet, but I wanted to share a few of the new dishes. My fave so far is this Grilled Zucchini Squash Sandwich with green tomato chow chow and vegan herb aioli on house-made bread (all of our breads and pastries are baked fresh by our baker, Ali). I know what you’re thinking — a vegetable sandwich can be such a cop-out. But not THIS vegetable sandwich. Chef Raymond must season this with gold because it is A-MAZING. The chow chow makes it tangy and slightly spicy. The veggies are grilled to perfection. I subbed vegan cheese for the Swiss that typically comes on the sandwich, and it was so good. The new menu also features Chef Raymond’s Three-Bean Hummus, served with fresh veggies and warm pita. Best hummus ever. The Tempeh Chili & Buffalo Cauliflower is to die for. The hearty chili is topped with crispy, spicy cauliflower and vegan cheese toast! The cafe does serve some dairy, but this one is vegan by default. That said, they’re happy to sub vegan cheese for any dish that has dairy cheese. And finally, here’s the Tofu & Grits — another fave new dish! Chunks of marinated, baked tofu topped with wilted spinach and sauteed peppers and onions over creamy corn grits. And it’s all brought together with redeye gravy. Very Southern! Very good! 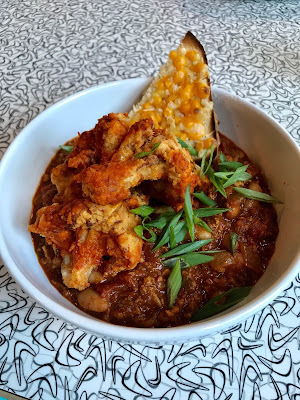 There’s also a new Fried Oyster Mushroom Faux Boy on the menu that I can’t wait to try and Raymond’s Caribbean Pepper Pot Soup with acorn squash and sweet potatoes. Check out the full ALWAYS menu here, and see daily specials on the Facebook page. Next articleLulu’s Baked School Lunch Brunch!